New Zealand gathered in prayer and mourning on Friday to honour the victims of last week’s horrific terror attack that claimed the lives of 50 people. 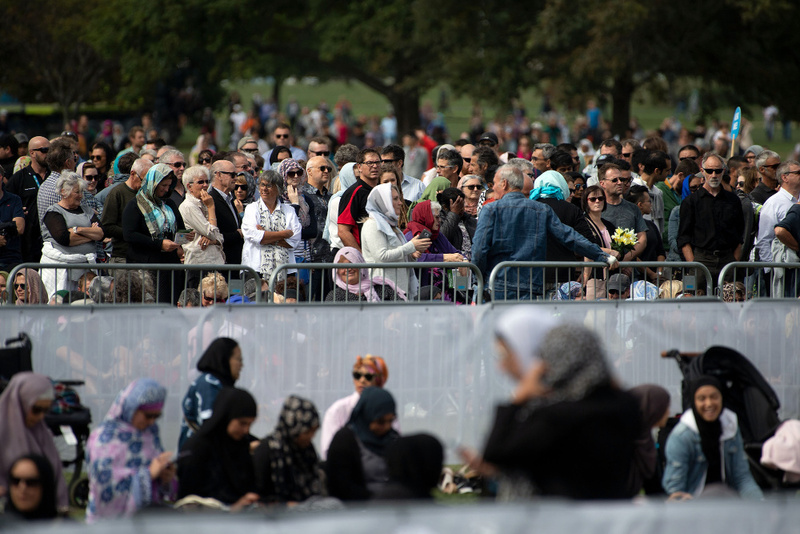 Thousands of people from across the country gathered at Hagley Park in Christchurch to listen as the Call to Prayer rang out across the city before observing two minutes silence exactly one week on from the devastating mosque shootings that rocked the nation. Following the beautiful moment of respect, Imam Gamal Fouda from the Al Noor Mosque, where 42 people were killed by the gunman, took to the stage to share an emotional speech broadcast around the world, in which he addressed the country’s support of each other in times of hardship. It was a momentous occasion for the Muslim leader who was delivering the sermon at the Al Noor Mosque last Friday when the attack took place. He continued by saying how the terrifying attack would only bring the people of New Zealand together and not tear them apart as the gunman had attempted. “This terrorist sought to tear our nation apart with an evil ideology … but instead we have shown that New Zealand is unbreakable and that the world can see in us as an example of love and unity,” he said. The imam also thanked the people of New Zealand for their support over the past week and made special mention of Prime Minister Jacinda Ardern, who’s compassion for the victims has made headlines around the world. “Thank you for your leadership, it has been a lesson for the world’s leaders, thank you for holding our families close and honouring us with a simple scarf. Thank you for your words and tears of compassion. Thank you for being one with us,” he said. Ardern spoke to the crowd of mourners prior to the Call to Prayer, greeting the thousands in Arabic. It was 1.32pm (local time) when the gunman entered the Al Noor Mosque in central Christchurch and opened fire on Friday, March 15, before driving about 5 kilometres across town and attacking the Linwood mosque, where he shot dead seven more worshippers. One person who was injured in the attack later died in hospital. A bomb was also found in a car on Strickland Street about 4 kilometres from the Al Noor Mosque. Four people were arrested, but only a 28-year-old Australian man has been charged with murder. The gunman is believed to have killed 42 people at the Al Noor mosque before driving about 5 kilometres across town and attacking the Linwood mosque, where he killed eight more people. One person died later in a hospital. Have you been following this story? Did you observe two minutes silence to honour the victims of the attack?